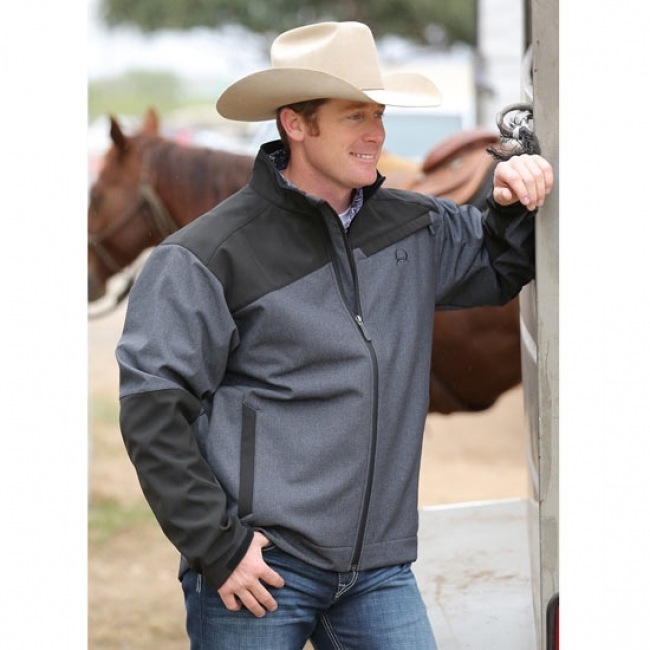 Cinch 2 tone black and gray men's bonded jacket. Best jacket. ever! The Cinch bonded jacket is a proven staple in the Cinch men's outerwear line-up year after year. The big decision is what style to choose, and in this case the jacket is black and gray so it is easy, right? This one has a new stylish spin to it. Same as the other Cinch men's bonded jackets, it has a softshell exterior for wind and water resistance, while the fleece inside is soft and warm. The full front zipper for easy on and off, sitting in the saddle or in bleachers at the rodeo. The zip hand pockets will to keep the hands warm and cell phone, keys and more secure and close. Outer is 93% polyester and 7% spandex. Cinch embroidered logo on front, bellow the neck and down left sleeve.